In 1997, there were 16 elephants touring the UK with circuses. But in January 1998, the release of an ADI undercover investigation of UK animal circuses precipitated the collapse of the animal circus industry. In the subsequent years, the elephants we featured were sold, retired or died – only Anne, a 56-year-old, arthritic elephant remained on tour with Bobby Roberts Circus. Many thought this poor, lonely, broken old elephant would mark the end of the line for elephants in British circuses. Defra was expected to finish a feasibility study in 2008, intended to inform new regulations under the Animal Welfare Act 2006, but despite a request signed by all of the animal protection groups, we have not had sight of this. 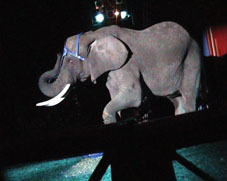 Supporters of ADI have been outraged that the Great British Circus is using elephants in its 2009 show. The show opened in February and continues the tour all summer. Audiences for the Great British Circus shows have been small, confirming that wild animal acts will linger on, despite lacking serious popular support. This needs decisive Government action. The Great British Circus features three elephants; Sonja, Delhi and Vana Mana (two Asian, one African), that have been touring Europe. It’s the first time in more than ten years that an elephant act has come to the UK to perform. The elephants spend most of the day in a small enclosure in a tent, with some access to an outdoor paddock – usually an uninteresting grass playing field. The show also includes a group of tigers (including a rare white tiger), lions, camels, zebras, reindeer and horses. Circus boss Martin Lacey was recently quoted as saying he was concerned about the recession but hoped the elephants would fill the void he expected from a downturn in business. In February, High Wycombe Council lifted a 16 year old ban on the use of domestic animals in circuses, with some councillors believing that the Animal Welfare Act was enough to protect the welfare of circus animals. Yet Defra’s delays mean that no regulations have yet been drawn up. Following the decision, Zippo’s Circus will visit High Wycombe. In October, Chesham Council reviewed their policy of allowing animals to perform on Council land, after Bobby Roberts’ Circus used Anne the elephant for promotion. Councillor Michael called for a ban, but the Council decided against. Lisbury Council also decided not to ban animal circuses. Many local authorities are confused by the discredited Defra circus report and the lack of regulation that was promised under the Animal Welfare Act. Many are taking guidance from the circus industry, which is making exaggerated claims about Defra’s position. In June, Wandsworth Borough Council will decide whether to ban wild animal acts. Battersea Park already has a ban on wild animal circuses and a recent request for a circus there was turned down. Councillors are being urged to extend the ban to cover all of the authority’s open spaces. ADI has made a written submission to the Council report and will be making a presentation. More than 180 cross-party MPs have signed a parliamentary petition calling for the Government to fulfil its commitment to ban wild animals in circuses and to set up a proper licensing system for domesticated animals. EDM 965, co-promoted by ADI, RSPCA, BFF, CAPS, is the animal welfare parliamentary petition with the third highest number of signatures, putting it in the top one per cent. Circus animals are not currently given protection under the Animal Welfare Act as circus regulations have not yet been written and Defra is expected to issue a feasibility study.